Which Peanut Butter is Healthiest? Peanut butter is a great addition to a healthy snack. Spreading it on apples or crackers is an excellent way to add fat and protein (and taste!) to a dull food. But, not all peanut butter is created equal. My husband recently found that out on a recent shopping trip. He does half of the grocery shopping, but peanut butter is usually my domain. Why? Because he is Australian. Australians grow up with something called Vegemite (which tastes NOTHING like peanut butter) and is a yeast extract. It is best served in Australia to Australians. What is my problem? (hey, snack girl, you have a partner who does some shopping - stop whining!) It has sugar and oil added to it. There is absolutely no reason to put anything in peanut butter. The ingredients list on peanut butter should look like this - Roasted Peanuts. There are plenty of brands in the supermarket that don't add anything to peanut butter and I'm not sure why Walmart decided to add stuff to theirs. I have written another scintillating post on peanut butter – What is the Healthiest Peanut Butter? to help you find the best brand. Also, I have taken a close look at Jif – which is one of the nation’s best selling peanut butters here: Natural Jif: What’s the Dif? Wouldn't it be cheaper to just grind up peanuts and put the butter in a jar versus adding other stuff? I actually bought a brand at Costco that said "All Natural" that had added oil. The front of the label tricked me into a huge jar of peanut butter with an ingredient I didn't want. If you are used to added sugar in your peanut butter, you will have a shock when you eat plain peanut butter. Then something magical happens! You begin to prefer peanut butter without anything added. It tastes better without the sugar (trust me). Peanut butter is a great source of protein, healthy fats, fiber and other vitamins that you need. Choose the right one and eat it with pleasure. So have I been fooled all this time with my Peanut Butter and Company choices! I love Bee Knees, and I KNOW it has added honey, but I didn't realize it also added palm oil and evaporated cane juice. What brand do you like? Can you tell? I love natural peanut butter, the one with "just roasted peanuts" - I don't know how anyone could eat anything else! YUM! Most of us grew up on PB&J. The only kind we knew had all that "stuff" in it. We got used to the sweeter taste but most stores don't offer a really healthy brand. I get Trader Joe's brand. Funny how the natural peanut oil rises to the top and has to be mixed. Very little has to be used as it is very potent with peanut taste. Here's to the original peanut!! I have been making my own peanut butter or sunflower seed butter for a while using a food processor. Sometimes the peanuts or sunflower seeds do not form a proper butter, instead they become a thick dry paste that is all wrong for speading. I think this may mean they're a little old. When this happens I very slowly drizzle a bit of either peanut or canola oil in until the texture changes. Usually it takes about 1 tablespoon, or sometimes less, for a pound of nuts/seeds. If I add oil, I also add 1/4 teaspoon of salt just for flavor. A pound of nuts/seeds will fill a 16 oz jar, so I don't feel especially bad about adding that amount of salt. If the oil starts to separate and rise to the top later, I stir it well with a knife and store it in the fridge. Smuckers has an all natural version with no added oil or sugar. Also Trader Joes sells a healthy peanut butter too. Here's a tip: If you stick your natural peanut butter upside down in the fridge when you first buy it, later on when you open it up, it will be much easier to stir the oil in. I like Skippy Natural or Natural Balance. Yes they have added oil (palm or flax) but I like a little bit of sugar to cut the overwhelming peanut taste of just ground peanuts. It's just my personal preference. I hate to eat straight peanuts and that what the real "all natural" peanut butters taste like to me. I suppose I'm a little strange, however I do refuse to eat low fat peanut butter which lastes like plastic to me. I always drain off a little of the oil before I stir it in. I LOVE Crazy Richard's Natural PB! And my favorite way to eat PB is a grilled PB sandwich. It's the best. Purchase the organic peanut butter...I get mine at Target and Kroger. There's no oil in 'em. Krema Natural all the way!! It doesn't go on sale much and is about .40 cents more per jar than other natural styles but SO worth it. I am not sure why...maybe they use higher quality peanuts or something. It is the best! Peanut Butter on high protein/fiber toast with half a sliced banana=best breakfast ever! I love natural PB. For longest time I fresh ground it from a grinder at wholefoods. Now I just buy it from Kroger. They have a crunchy and a smooth variety that is just peanuts and salt. I like the salt. It makes a huge difference to me. The reason manufacturers add other ingredients is simple. Fake sugars and fake oils are cheap. When you add them to real ingredients (like peanuts) it acts like a filler and they get more volume per peanut ;-) It "spreads" out their profits! My husband is British so we have lots of Marmite around the house which is the equivalent to Vegemite in the UK. Can't stand the stuff and he despises peanut butter so I guess we are even. You are right, going from Skippy to the natural stuff takes some getting used to, but I can't imagine ever going back. Trader Joe's makes awesome peanut butter with nothing added. I LOVE my Trader Joe's PB! It's the best. I share it with anyone who will take some, and they're always astounded at the incredible flavor. We keep the cheap stuff in the house for our dog, and the last time I opened a new jar I tasted it. It was like eating wax! I can't believe I ate that stuff for years, but who knew how bad it was? But I like my peanut butter the way it is... that doesn't make me some troglodyte people! My doctor (practicing in functional medicine) recommends eating organic almond butter, with no added sugar, salt or oil. Marantha makes crunchy and smooth, and it tastes delicious on apples, crackers, etc. 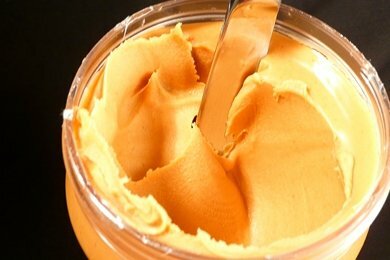 Regular peanut butter can contain pesticide residues from the spraying of the peanut plants with round-up and other weed killers. Just go to Trader Joes and buy peanut butter. It is fantastic. We will never go back to the store bought name brands. they taste like plastic compared to real peanut butter. My favorite way to eat it is after a great work out and between meals when I am famished...I smear it on apples or pears. It is the best and fills me up. Not all Costco's carry the same products - but my local Costco in Kansas City has Almond Butter ...it has one ingredient - "dry roasted almonds" and I LOVE it!